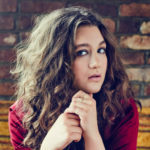 As a rising 16-year-old singer/songwriter and junior at the High School of the Performing Arts in New York City, Whitney Woerz is equal parts passion and talent. Combining an alternative pop sound with lyrics firmly rooted in personal experience, Whitney’s music possesses a depth and sonic maturity that extends well beyond her years. Her honesty and transparency produce profoundly impactful music that poignantly depicts a multitude of personal experiences that are accompanied by a range of emotions. Her latest EP, Iridescent, was released Summer 2017 via 600 Volt with distribution provided by RED. Touching on life’s intersections of teen angst, un-requited love, friendship and emotional challenges, Whitney has a professional musical maturity that has been compared to that of Sara Bareilles, Alessia Cara, and Tori Kelly. Whitney’s honesty is apparent on the hard hitting, “Misplaced Your Love,” which explores the struggles that can arise in relationships, while Whitney’s ability to transcend genres is apparent in the R&B and funk infused “Carousel.” “Missing You More,” tackles the loss of a loved one in a poignant ballad that showcases Whitney’s remarkable vocal range, while the EP’s first single Idea of Her, pairs an infectious melody with a warning to look deeper than the image a person is presenting. Whitney’s strength as a songwriter stems from her ability to poignantly and accurately depict a multitude of relevant teenage issues. She is a teen ambassador for Glenn Close’s non-profit organization, BringChange2Mind and has made a commitment to share a portion of her profits with the organization. Through her music, Whitney has emerged as an advocate against bullying. In her own voice and her own way, 16-year-old Whitney Woerz is coming of age. Her music is well beyond her years. Her lyrics are sincere and forthcoming – a recipe for a bond that will no doubt see her sharing her musical journey with her fans.